DETROIT — I grew up in the San Francisco Bay Area during the proto-tech days of letting one’s freak flag fly, so when I say something is “weird,” I sometimes have to remember, especially in the normalcy-loving Midwest, to offer the caveat that I do not mean it in a pejorative way. Weird is good, weird is interesting, and a lot of art is weird — so it is a special mark of distinction, I think, to say that the assorted and collected works of septuagenarian artist Jon Strand are deeply, maybe even hauntingly, weird. 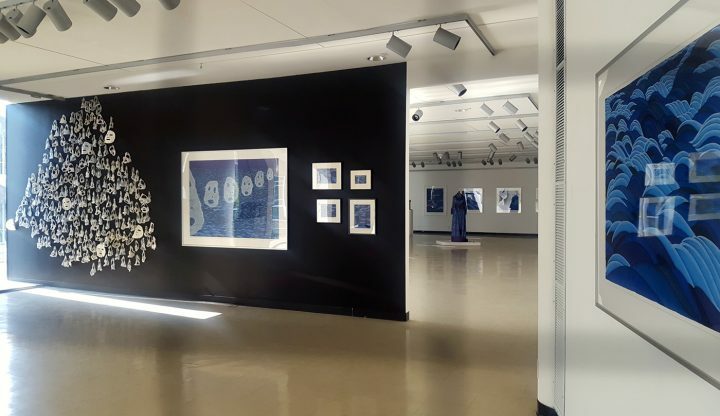 A career survey of Strand’s decades of interdisciplinary works was mounted at the Wayne State University Art Gallery this month, hosted by the James Pearson Duffy Department of Art and History. JON STRAND: ORACLES, TEMPLES AND WAVES… and a dragon called Raoul not only features a cross section of works from Strand’s 50-plus years of art-making (42 of them in Detroit), but emphasizes the role of collaboration in Strand’s creative process, calling out contributions by a coterie of other artists in the old-Detroit pantheon, including Bob LaRose, Jeff Hucul, Leslie Ann Pilling, S. Kay Young, Christine Welch, Judy Adams (and Fabrazzio), Barb Prusak, Sherry Jolls, Stefan and Kathy Graf, Jack Whitehead, Dolly Whitehead, and Jo Levett. A pantheon is a good concept to bring to bear on Strand’s work, two decades of which carry the narrative thread of his alter-ego “Jonny Strange” — who embarks on a surrealist hero’s quest to Neo-Helicon, home of the nine muses and the god Apollo, to call the gods of old to account for horrors of the world, and appeal to the eternal virtues they represent. 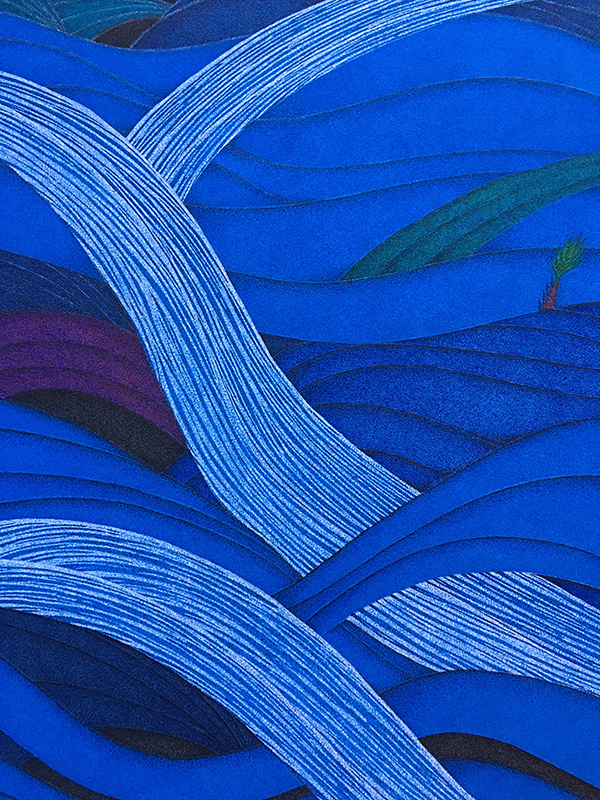 This journey is captured in a series of mind-boggling contemporary pointillist drawings, in which Strand assiduously renders the landscapes and architecture of this mythic world in red- and blue-scale Radiograph pens. Not one to put too fine a point (haha!) on the labor-intensive nature of these works, Strand can recall precisely how much time has gone into each of them, with numbers ranging as high as 1,800+ painstaking hours for 42 x 58 inch works. A more recent pointillist series, An Epic of Distance and Time, which encompasses more than 60 pieces, dispenses with most figuration, in favor of endless seascapes, waves piling upon fine-particle waves. These Herculean drawings form the backdrop for Strand’s 3D and installation works, which raise the weirdness ante to a whole new level. Another thing afforded to me by my upbringing in the Bay Area during the peak of the AIDS epidemic was a balcony view of the tremendous and catastrophic impact of the disease on the community. 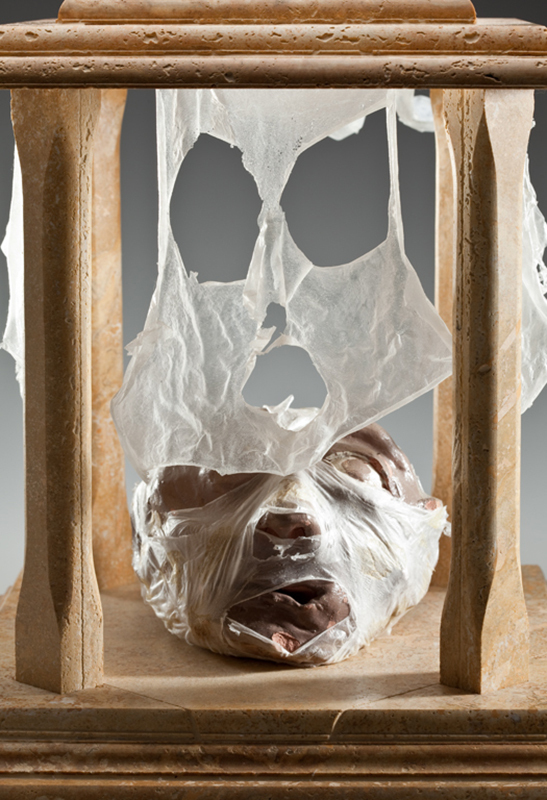 In his work, Strand absorbed the pain of losing a friend to AIDS in 1993, reflected in a new movement that employed as materials the facial peels that were part of his friend’s daily skin care routine. 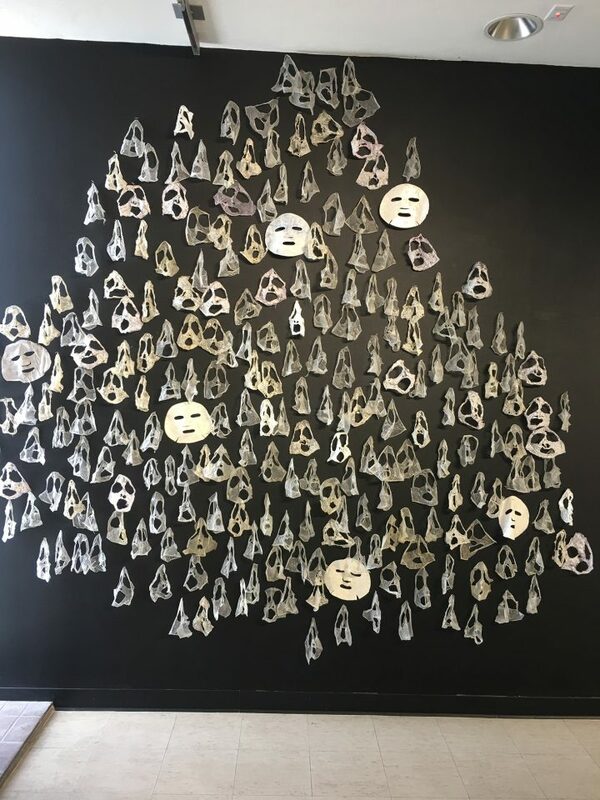 These delicate shredded faces, carefully removed to preserve the eye and mouth holes, are sometimes mounted inside temple-like structures atop pedestals, and a whole flock of these visages hang in a ragged formation against a black wall in the first gallery. The word “murmur” comes to mind — both in a sense of the inaudible whisperings of these ghostly oracles (characterized as such in, for example, a 2011 – 12 drawing by Strand that features them, titled “A Chorus of Oracles”), and in the variant of the term used to characterize the hypnotic and intuitive flocking of birds. As an advocate of the weird and uncanny, it is rare that I find myself in a state of wonder over the very fact of someone’s art. I understand art for art’s sake, as a mode of self-expression, a communication tool, a market gambit, a celebration of beauty, a processing of the world. Strand’s process and output stand apart from all of that. There is a kind of monomania at play here, so deep as to be admirable, but also alienating. Strand is certainly happy to have his lifetime of work recognized on this quotidian plane, but there is an unshakable sense that his art is answering a much higher call, and his process is one that lifts him out and above this mortal coil, in communication with a world the rest of us can only see from the artifacts he channels. 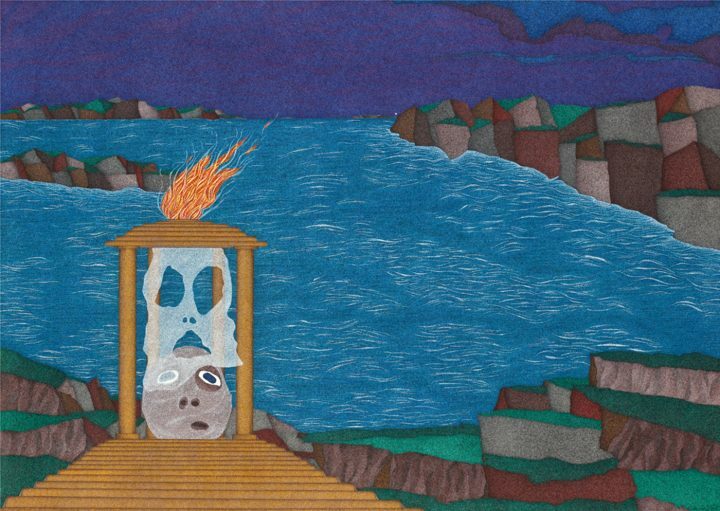 JON STRAND: ORACLES, TEMPLES AND WAVES… and a dragon called Raoul continues at Wayne State University Art Gallery through August 24. The post 50 Years of a Beloved Detroit Artist’s Hauntingly Weird Paintings appeared first on Hyperallergic.